Easter Egg Hunts are a big part of the Easter tradition in our household. What little kid doesn’t LOVE a good hide and seek game? We decided to upgrade our Easter Egg Hunt game this year and we had a Glow in the Dark Egg Hunt! 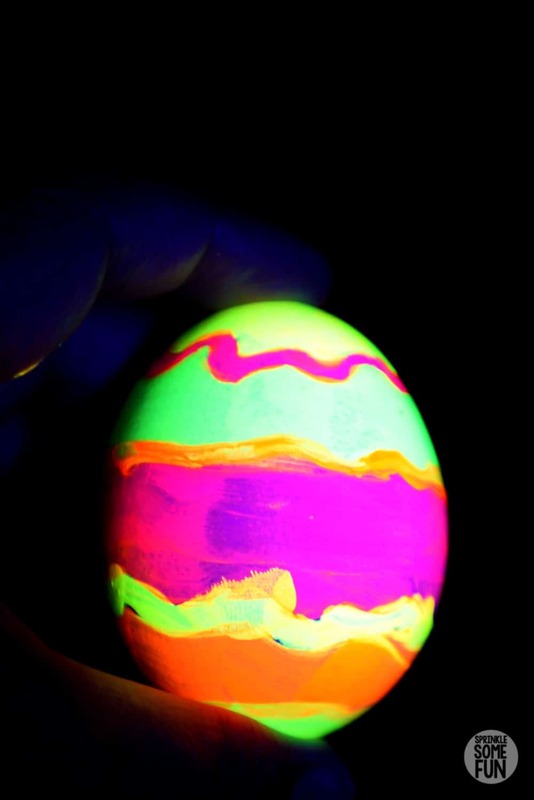 To make the egg hunting more of a challenge for the bigger kids we painted hard boiled eggs in blacklight reactive paint so that they only glowed under a blacklight. 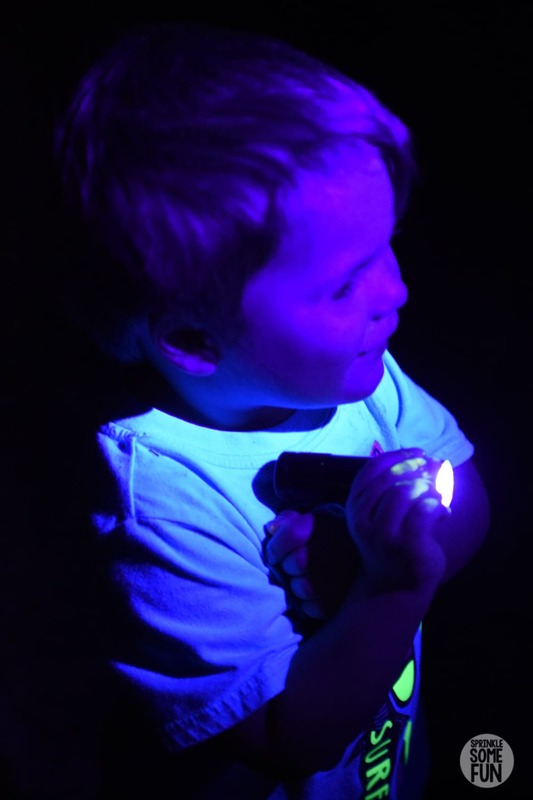 We bought blacklight flashlights for them to find these hidden eggs and they LOVED it! They were truly hidden in the dark and only could be seen with the blacklight flashlights. The flashlights we bought are from Amazon and they worked perfectly for the egg hunt! You can find the blacklight flashlights here (affiliate). These flashlights were really bright and lit up the eggs, but not the grass around them. 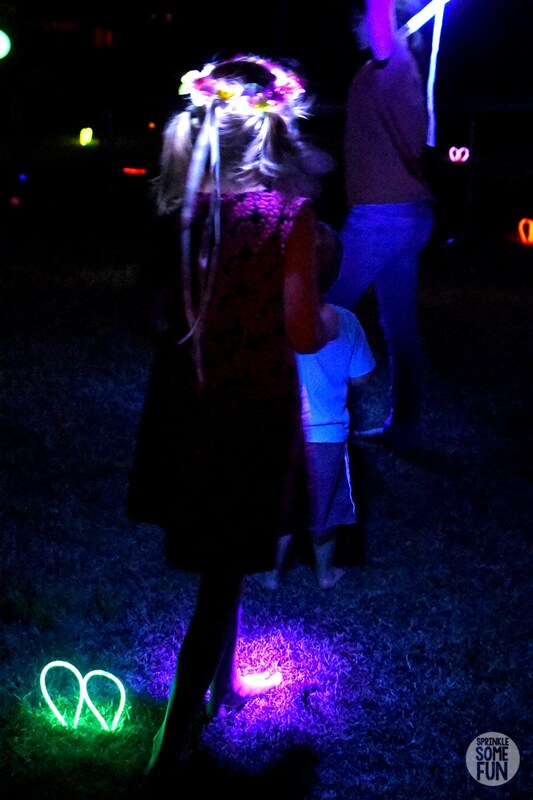 Even the little ones loved the blacklight flashlights and found a few of the blacklight reactive eggs also! 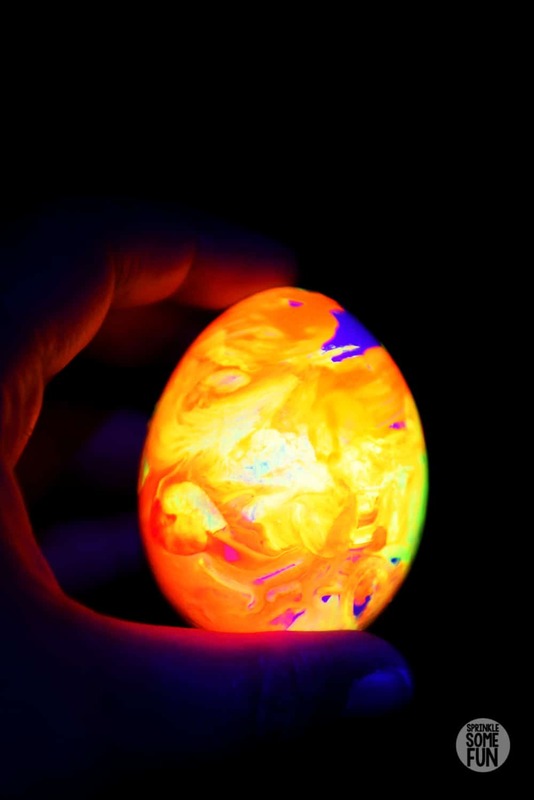 To make any egg into a blacklight reactive egg just paint them with neon acrylic paints! I found my neon paints at Hobby Lobby, but these acrylic paints from amazon (affiliate) will work too! The paints we used were specifically stated to glow under a blacklight so make sure whatever brand you buy specifies this! I let all the kids paint on the eggs and they had a blast! Most acrylic paints will stain clothing so keep this in mind when painting your own eggs. We did not try out the paints on the plastic eggs so I am not sure the paint will stick to those. To be sure your paint sticks use only hard boiled eggs or craft eggs. Each egg turned out so pretty and unique! Some of the kids made designs and others made marbled looking eggs. 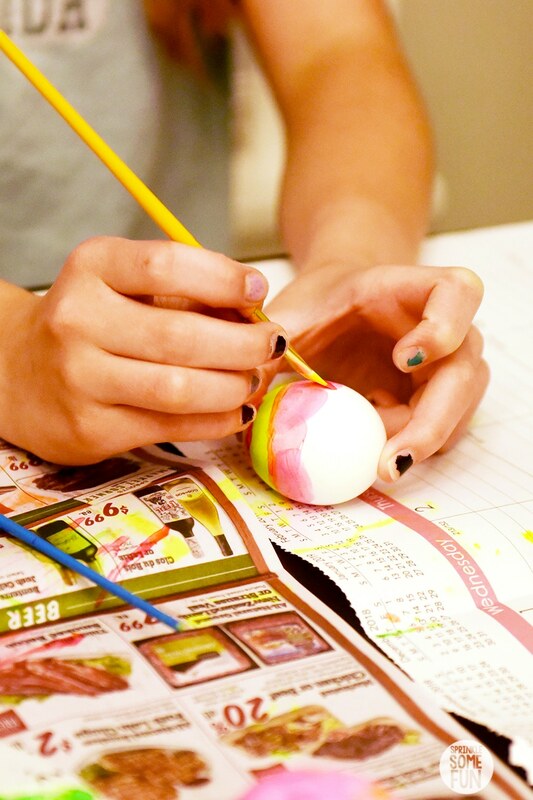 We love egg decorating because it’s a great activity for the whole family to get involved with. 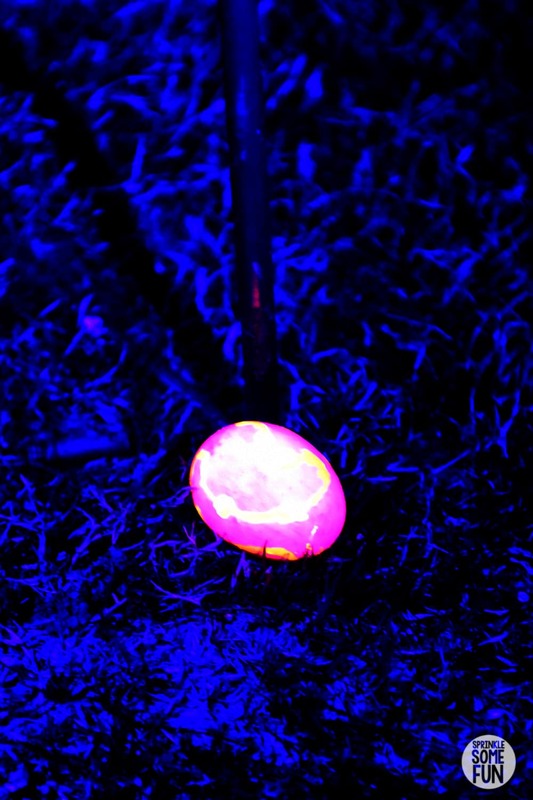 It was the highlight of the night each time another neon painted egg was found with the blacklight. Just make sure to count them if you are using hard boiled eggs to make sure you get them all. The worst smell is finding a hard boiled egg in the yard weeks later! Yuck! 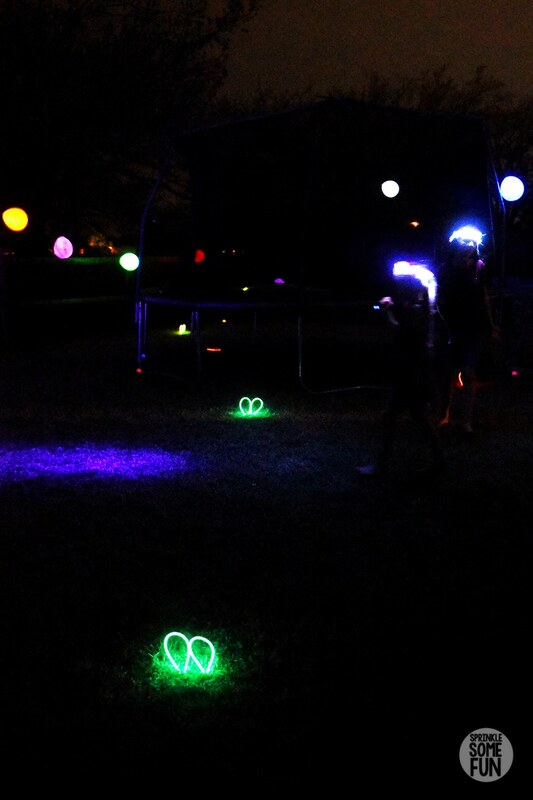 Of course we had the whole egg hunt set up with lots of fun glow in the dark ideas like putting glow bracelets and necklaces in the ground to look like bunny ears! The ground was really soft when we put the glow sticks in the ground, but you make need to make the holes with something stronger before trying to put them into dry ground. 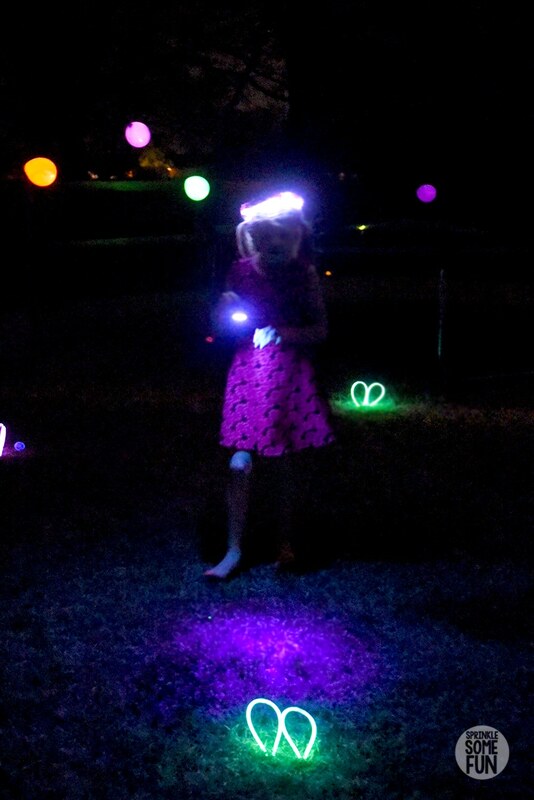 The glowing bunny ears made it really easy for my 3 year old to find the glowing eggs. I told the older kids to find the hidden ones and this allowed my littler kids to find the easy glowing eggs! I love that there are more and more options to create glowing Easter Eggs! 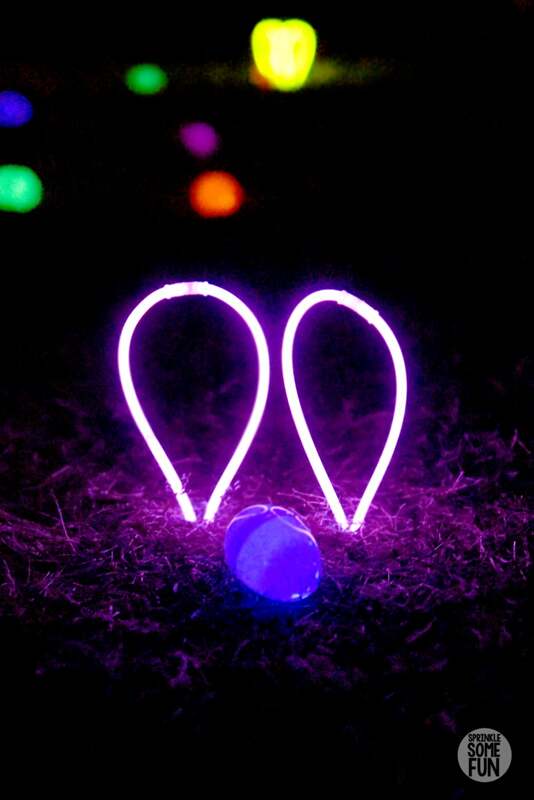 We found these Easter Egg glow sticks to put into each egg and they worked great. Find Easter (affiliate) Egg Glow Sticks at Amazon. 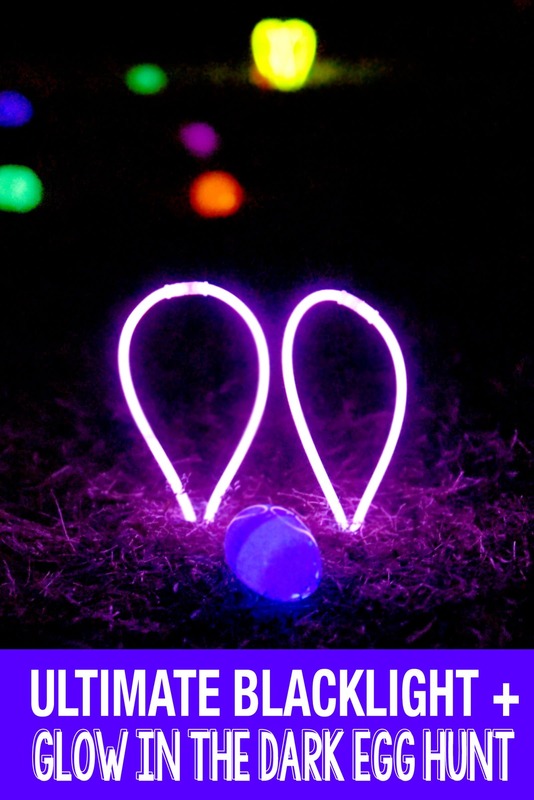 If you want to add a little pizzaz to the Easter Egg Glow Hunt these (affiliate) Light Up Balloons are so cool! We just hung these to the fence and let them blow in the wind, but they can also be filled with helium. They looked so cool hanging around the yard! For the girls we also had fun light up flower crowns! I made these, but you can also buy pretty light up flower crowns from Amazon (affiliate). 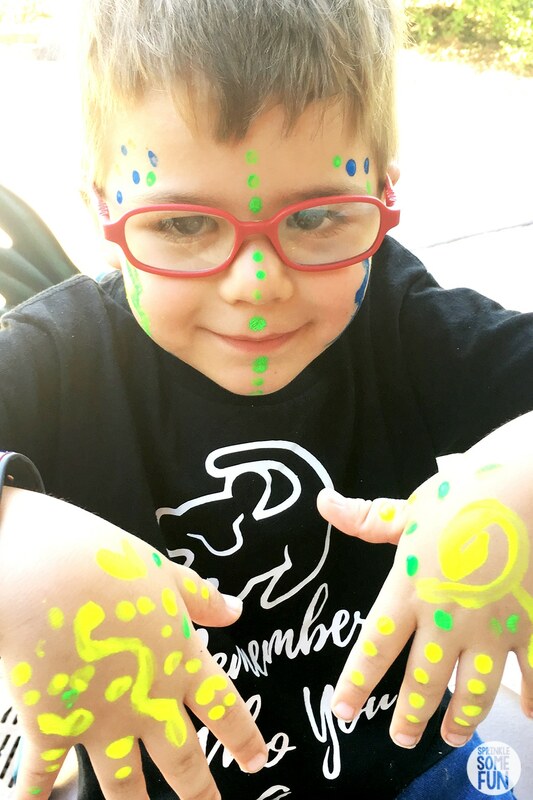 The boys wore the glow bracelets and necklaces found here (affiliate). You can also find all kinds of glow in the dark products at the Dollar Tree! 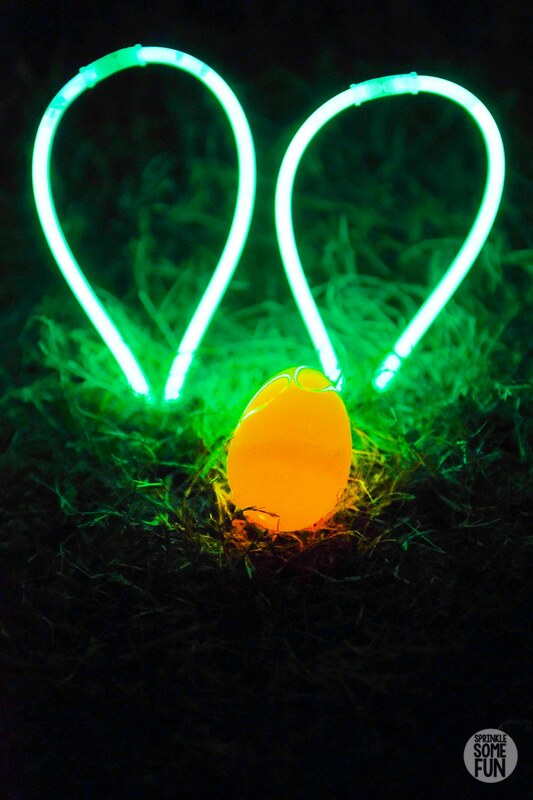 What is great about a Glow in the Dark Easter Egg Hunt is that it can be done indoors or outdoors! We prefer the outdoors, but if it’s raining we can do it inside too. If you have a crowd or just want to go all out then we love these (affiliate) Blacklight reactive face paints! I used these on our recent Disney trip and they worked great under the black lights. We didn’t have the time to face paint before the egg hunt, but that would have been so cool! 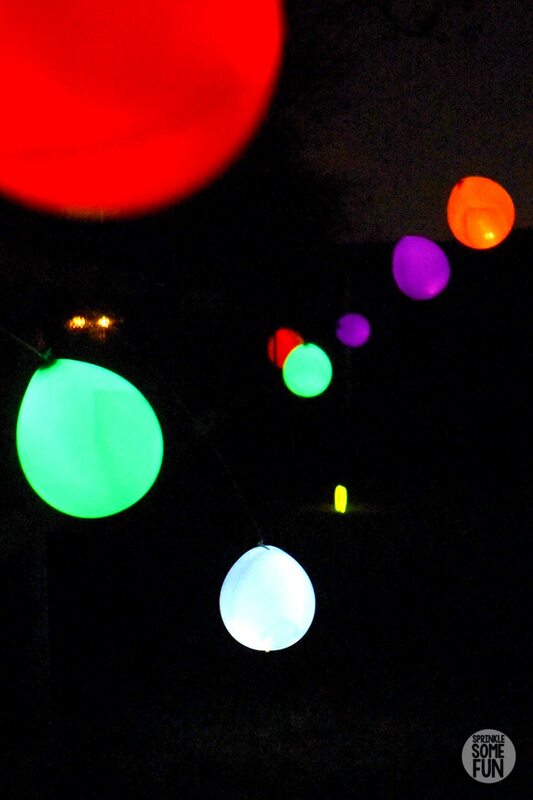 We will definitely be planning a Glow in the Dark Egg Hunt again for next year! I want to add fun prizes for the kids too since I really didn’t add candy or anything to the eggs this year. 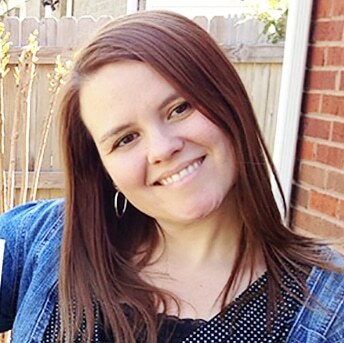 What fun prizes do you have for Easter Egg hunts with your family and friends? 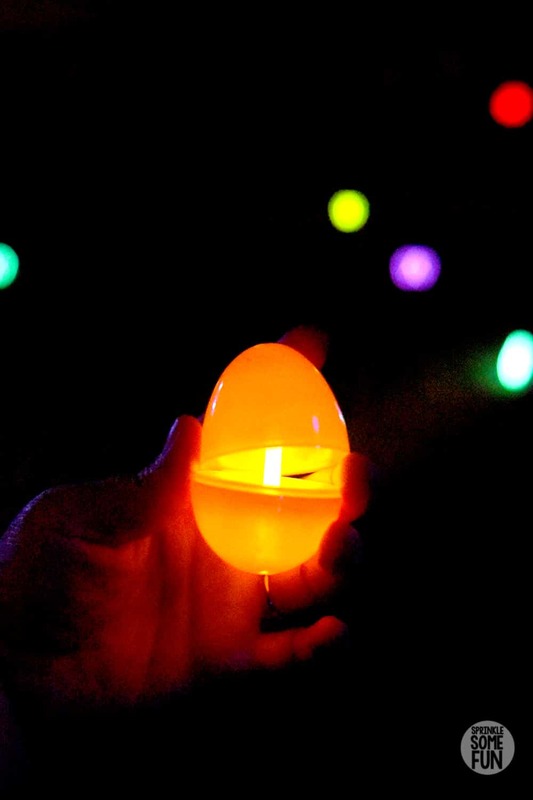 I’d love to hear all your great ideas on how to make the best Glow in the Dark Egg Hunt!